The Catholic Daughters meetings are held on the 2nd Monday of each month for 10 months of the year. There are no meetings in July and August. If you are a Catholic woman, 18 years of age you can join the organization. Drop by a meeting and see what we are all about! Presently there are 127 members, but of that number, approximately 45 - 50 are active members. 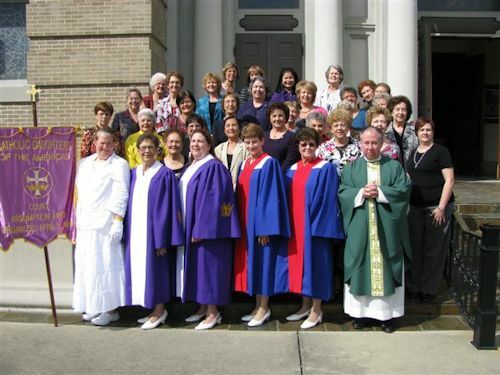 The Catholic Daughters of the Americas is the largest women's organization in the United States. The motto is “Unity and Charity”. They lend a helping hand to the Church parish and area Catholic schools. They also assist the city and the community by giving of their time and money for charitable projects. They assist at the nursing home for weekly Masses. Some members are Pink Lady volunteers at the hospital and host the Food Net Drive. Many also host and serve at all of the Church receptions, First Communion, Confirmation, Seder Meal, etc. The Catholic Daughters were involved in sending donated items to missions under the Project Handclasp Program. They are involved in the Easter Basket Project where they distribute baskets to the Chez Hope children and St. Mary Parish Special Needs children. Baby Showers were also held, where our members made crochet blankets, receiving blankets, burp pads, and purchased diapers, wipes and many more baby items. These items were all donated to our local Emergency Aid Center and the Desormeaux Foundation in Lafayette, where these items are available to young mothers (who choose life) and they are for sale at Baby & Me Boutique. We have two fund raisers, a spring and a fall bake sale. The Catholic Daughters also promote spiritual and social awareness of our Catholic faith by working hand in hand with the CCD program and filling in at the schools for religious and academic programs as teachers and workers. We donate to local, as well as state and national charitable organizations. Contact person is the current Regent, Kim Pusateri at 337-828-3841 or call the rectory at 337-828-3869.